The best — and least expensive — way to improve your guitar’s appearance, as well as its tone, is to administer a thorough cleaning. But there are a few guidelines that need to be followed when tackling the dirt, grease, perspiration and smoke that may have accumulated on your guitar, either from regular use or neglect; otherwise you risk permanently damaging the quality and resonance of your instrument. Whether it’s an acoustic or an electric that you’re aiming to clean, these tips still apply. If you have a vintage guitar, you’ll need to take special considerations, as explained in a note below. Ideally, you should clean your guitar each time you change the strings. With your strings off, you have much better access to your fretboard. Plus, you don’t want your strings to come into contact with any oils, polishes or damp cloths that you may use during the cleaning process. Play it safe by removing only two or three strings at a time so that you don’t cause the neck tension to go out of whack. Even on a frequently played guitar, the fretboard really only needs to be cleaned once or twice a year. That’s because it’s important not to mess too much with the natural moisture the fretboard picks up from oils on your fingers.Begin cleaning your fretboard with a soft, damp cloth (an old T-shirt or sock will work) that you have wrung out as much as you possibly can; you don’t want to see any drops of water on your fretboard. Work the cloth down the fretboard, making sure to use different portions of the cloth so that you’re not just transferring dirt from one fret to another. If your fretboard has accumulated some significant grime, you may need to follow your rag cleaning with a very light brushing with some extra fine #000 or #0000 steel wool. Please note that tiny steel wool particles can stick to the magnets in your pickups. It’s best to cover up your pickups when cleaning with steel wool. For spots that are particularly hard to get at, you can try using the edge of a credit card, a damp cotton swab, a pipe cleaner or a small toothbrush. If you notice that your fretboard has dried out or developed hairline cracks, you may finish this process with Gibson’s Luthier’s Choice Fretboard Conditioner. Alternately, you can rub one or two drops of oil (mineral, almond or linseed oil) into the fretboard to condition it. Make sure to wipe off excess oil with a soft, dry rag. All you generally need to clean your guitar is some elbow grease and a soft, dry cloth. If a dry cloth is not cutting it, you may use a damp cloth that has been well wrung out. Several times a year, you may want to use a polish after you’ve done your cleaning. Almost all Gibson guitars are treated to several coats of a high-quality nitrocellulose lacquer. This is a finish that ages beautifully but that is porous. For that reason, you need to be discriminating when selecting a polish. 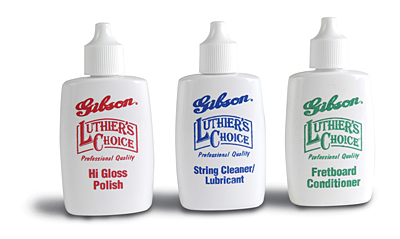 We recommend using one of two products specially formulated for Gibson brand guitars – our Pump Polish and our Luthier’s Choice Hi Gloss Polish – both of which have become industry favorites. In a pinch, you may also dilute Murphy’s Oil Soap for use as a guitar polish. Make sure to squirt your polish onto a rag, not onto the surface of your guitar. And remember to clean not only the top and back of your guitar, but also its neck. Whatever you do, don’t use furniture polish on your guitar. These oils can permanently alter the resonance of your guitar, as the wood experiences a change in density when it soaks up these polishing agents. Spray a dry cloth with glass cleaner and polish each of your tuning keys to get them gleaming. A damp cloth should suffice for cleaning your bridge, but you may want to use a pipe cleaner or small toothbrush here for significant grime. If your pickups look rusty, you’ll want to unscrew their faceplates with an Allen wrench and, being careful not to disturb the wiring, clean the rust with a rust-dissolving agent. If you don’t spy any rust, simply polish your pickups with a soft cloth. It’s tempting to hang your pride and joy on the wall or to leave it resting on a stand, but it’s not a good idea. After playing or cleaning your guitar, put it back into its case where it belongs. The finish on older guitars is often significantly thinner, yielding a better tone. However, this means that vintage guitars are more vulnerable to the waxes, oils and silicates in polishing products. Vintage finishes are also more likely to be “checked.” You want to avoid working any polish or water into these cracks. Instead, try placing your face close to your guitar and breathing warm, moist air onto the dirty spots. Then immediately wipe down your guitar. If you’re particularly unsure about how to handle an old finish, ask your repairperson or call Gibson’s Customer Service at 1-800-4GIBSON (1-800-444-2766). 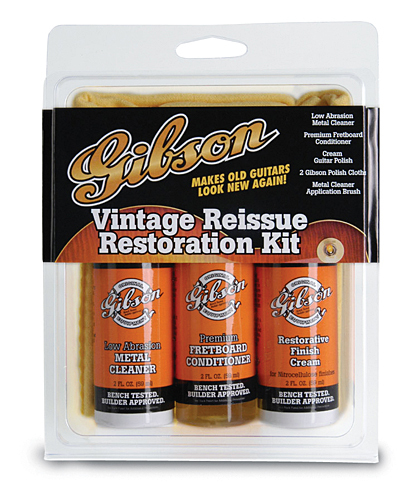 For foolproof vintage guitar cleaning, consider Gibson’s Vintage Reissue Restoration Kit, which includes two polish cloths, a low abrasion Metal Cleaner, Fretboard Conditioner, and Restorative Finish Cream specially formulated to treat and protect older finishes and fretboards. Thanks so much for the cleaning tips! I appreciate all the info that you listed that I may not have thot of. I have an older jumbo acoustic that I’d like to bring back to its original glory and this will defiantly help! Cheers!